In August 2018 the Foodhallen opened on the Wilhelminapier, just on the other side of the Erasmus bridge. Housed in one of the old warehouses stemming from 1941, the Foodhallen bring together some of the most popular flavours from across the globe in an industrial setting with a true Rotterdam atmosphere. There is a great diversity in food, including vegan and vegetarian options, which make it one of my go to places. So what to choose? Fabulous Span comes from Txosta, American BBQ from Roffa Streetfood Bar and Bavette has one of the best bar bites in Rotterdam; wagyu bitterballen. For a trip to Mexico, Lima is your stop and Indonesia beckons at Warung Indonesia. For all vegans and non-vegans because the food is simply that good, stop at Backyard. Vietnamese street food comes courtesy of Viet Yam and is mind-blowingly delicious! Bar Polpo brings you seafood and the thin fries are finger-licking good. The smell of Italy tickles your nose as La Pizza. Caribino Latino will fulfill all Surinamese and Caribbean flavours needs without booking a ticket to the tropics. Foodshed is high-end food truck cuisine — two words: lobster hotdog. Kyatcha has the best sushi I have ever had and Bao Mazing’s dim sum and bao buns are indeed amazing. Ten to Three bakery has an array of delicious cupcakes, cake pops and brownies including gluten-free options. 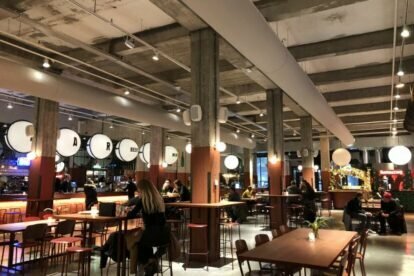 The Foodhallen are a great addition to Rotterdam with delicious flavours, great drinks and something for everyone. You won’t regret it!